irocku is pulling no punches this week as we bring you an American Treasure, Ray Charles and one of his signature songs, What’d I Say. 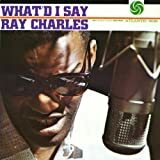 Released as a single in July of 1959, “What’d I Say” is a fusion of soul, blues, gospel and rock and roll, representing the first crossover hit by Charles and the top selling record of all-time for Atlantic Records. What’d I Say is on the list of top rock piano songs of all time and is another song that every rock keyboardist MUST have in their repertoire. It’s got a left hand groove that can turn any song into a rocker and right hand riffs that can spice up any song. Level 1: Practice the C Major scale.First Week: Beginners practice the Lesson. Intermediate and Advanced students practice the Groove Chart and the Lesson. Second Week: Add the Exercise and Improvisation to your practice. What'd I Say is all about the groove. Get that left hand down so you can play it your sleep! Level 2: Practice the F Major scale.First Week: Beginners practice the Lesson. Intermediate and Advanced students practice the Groove Chart and the Lesson. Level 3: The quickest way to rock is by learning the Groove Chart! To help with improvising, practice the F Major scale and learn the F Blues scale.First Week: Beginners practice the Lesson. Intermediate and Advanced students practice the Groove Chart and the Lesson. Level 4: The quickest way to rock is by learning the Groove Chart! To help with improvising, practice the F, Bb , C, two-octave scales and learn the F Blues scale. Also learn the F7, Bb7, and C7 chords.First Week: Beginners practice the Lesson. Intermediate and Advanced students practice the Groove Chart and the Lesson. Levels 5: The quickest way to rock is by learning the Groove Chart! To help with improvising, practice the E, A, and B, two-octave scales and learn the E Blues scale. Also learn the E7, A7, and B7 chords.First Week: Beginners practice the Lesson. Intermediate and Advanced students practice the Groove Chart and the Lesson. Levels 6 and 7: The quickest way to rock is by learning the Groove Chart! To help with improvising, practice the E, A, and B, three-octave scales and learn the E Blues scale. Also learn the E7, A7, and B7 chords.First Week: Beginners practice the Lesson. Intermediate and Advanced students practice the Groove Chart and the Lesson. Are we supposed to swing this song? That’s awesome. Everything about it is spot on. Thank you for sharing. That’s AWESOME!!! Great job, Jagger!!! I made it to level 7!!!! Here’s a practice tip for “What’d I Say”. Be relentless about using a metronome or a drum kit app. Ray Charles’ timing is absolutely perfect and you can lose the groove by even being a slight bit off. Be certain that the eighth notes in the left hand land at the right place in the beat. You should also pay close attention to the turn-around ( measures 21-24). Ray Charles sounds very loose when he plays but he is a master technician and that turn-around can sound like mud at the upper levels if you don’t play each note cleanly. He really was a true genius. I had a question on the song” What I say ” lesson 7. You play section 29 and then 33 ( on page 2) THEN BEFORE YOU PLAY SECTION 37 YOU PLAY SOME THING THATS NOT ON THE SHEET MUSIC AND THEN YOU GO INTO SECTION 37.I WAS WONDERING WHAT THAT WAS. Thanks. In the ‘Preview’ of the lesson Collin plays the first six bars of the ‘Improvisation’ lesson during the break. So you should check out the improv. You might want to also check out Ray’s original recording and try to figure out some of the other things he is doing. Ray is mostly working with the E blues scale but funking things up with eighth-note syncopated rhythms and cross-rhythms. I thought I was paying for sheet music of what the preview showed. Instead …. not what I paid for. The level 7 previews are a combination of the lessons, improvs, exercises, groove charts, and scales and chords suggested in the Lesson Schedule. The complete “What’d I Say” is provided in this lesson but different elements are taught in the Lesson, Improv, Exercise, and Groove Charts. For most of the Previews the performer plays through the Lesson and uses techniques shown in all of the videos and mixes them up to his liking during the improvisation. The improvisations on the preview are based on the Improvisation lesson that we provide but the performer might introduce additional techniques, patterns, and rhythms found in the lesson videos. When we designed the IROCKU lessons Chuck stressed the importance of getting people ‘off the page’. Unlike classical players, only 10% of all rockers can read music and Chuck himself isn’t much of a reader. Rockers piece together songs by listening, and learning the progressions, the grooves, and then filling in with melody and riffs(mostly from the scales and chords). We try to provide the tools for our students to expand beyond the written page, which is why we provide the groove charts, exercises, and improvs along with the lessons. When we designed the lessons Dr. John insisted that we teach our students to play in different keys. Which is why you will find the exercises and improvisations in multiple keys. In fact, Dr John says that he often changes the key of a song based on the musicians he’s playing with, the nature of the gig, etc. He wants our students to be able to do that as well. We provide written improvisation examples to get you started but it’s best if you experiment and explore on your own. The groove charts are intentionally designed to force you off the page and are a great way to begin getting away from the written notes. Don’t worry about playing the notes exactly as they are played in the videos. Get the groove down and supplement it with chord inversions and licks of your own. You’ll find that after working through a half a dozen of our songs (including groove, lesson, exercise, and improv) that things will start falling into place and picking up songs and improvisations will become easier for you. If you work your way up to our level 7s and master the content (i.e.songs, improvs, groove, and exercises) you should be capable of learning any rock song or riff. Chuck would prefer to see you come up with your own version of the songs rather than learning ours. Our goal is to provide you with the tools to do that. Thanks a ton Newman! I hope you are having a great time with irocku as much as I am! Jagger- that is just totally awesome! I’m fairly new to the piano world, I really love playing!